Chevron's faltering "racketeering" (or RICO) case against the Ecuadorian villagers the company poisoned with its toxic dumping was just rendered a nullity by the U.S. Supreme Court, dealing another major blow to the oil giant as it attempts to evade paying the $11 billion pollution judgment. Chevron in 2010 deployed hundreds of lawyers to attack and try to demonize indigenous villagers who has just won a multi-billion dollar judgment in Ecuador against the company. Three layers of courts in Ecuador had found Chevron guilty of dumping billions of gallons of toxic waste. Chevron was also reeling after having been embarrassed by brutal exposes of its jungle misconduct in prominent media outlets, including 60 Minutes, Vanity Fair, and The New York Times. Chevron of course believes the rule of law should apply only when it wins in court, not when it loses. Rather than being assigned randomly, Chevron's RICO case was grabbed by a headline-hungry U.S. judge who never disclosed he had personal investments in Chevron when he presided over the case, despite clear signs he was motivated by bias. The judge, Lewis A. Kaplan, constantly disparaged the villagers and their country from the bench. A prominent law scholar, New York University Professor Burt Neuborne, blasted Kaplan for engaging in "judicial slander" to undermine Chevron's victims. Other international legal scholars and U.S. civil society groups such as Amnesty International and Earth Rights criticized the judge for his intellectual dishonesty and animus toward the indigenous groups. A subsequent bench proceeding (Kaplan refused to seat a jury of impartial fact finders) looked more like a Soviet-era show trial. Chevron corporate executives cheered from the gallery and virtually every ruling went in favor of the company. Meticulously choreographed, the Chevron-Kaplan show trial was a mockery of justice from the start, and the case should have been thrown out immediately, as underscored by the U.S. Supreme Court decision. Chevron's RICO case in Ecuador already was doomed because of its countless legal excesses and absurd factual findings. Now, the Supreme Court has ruled you can't bring a RICO case, even a legitimate one, based on harm that took place abroad. This is another example of why Chevron's RICO case should have been thrown out on day one. Chevron and its investigators (Yohi Ackerman and Andres Rivero) paid $38,000 in cash out of suitcase and more than $2 million overall to an admittedly corrupt former judge in Ecuador, Alberto Guerra. In exchange, Guerra became Chevron's star witness and lied on the stand by claiming he had been in a meeting where a "bribe" was discussed. Subsequent to the RICO trial, Guerra admitted admitted under oath that he made up key parts of his testimony. He also confessed to accepting bribes when he was a judge, and paying bribes to judges when he was practicing law. It also emerged that Guerra admitted lying to Chevron to induce the company to pay him more money for his testimony. "Money talks, but gold screams," Guerra told Chevron in a taped conversation. Chevron put Guerra on the stand in the RICO case after the company's lawyers at the U.S. firm of Gibson Dunn coached him for 53 consecutive days. After the coaching, Guerra began to claim he had information the plaintiffs wrote the trial court judgment. The claim was a lie, as an independent forensic analysis later proved. Neither Chevron nor its outside lawyers have been held accountable for coaching a witness to lie in a federal court. The judge also let Chevron pay more than $15 million to Kroll, a private investigations service populated by former FBI and CIA agents, to spy on lawyers for the villagers -- a clear violation of the law and professional ethics. U.S. attorney Steven Donziger was followed and harassed by six separate Kroll agents in Manhattan. Kroll also admitted it prepared 20 to 30 reports on Donziger in an attempt to dig up dirt and discredit him. Chevron also convinced Kaplan – who has a long history of hostility toward plaintiff's lawyers – to actively promote its scheme. Kaplan denied the Ecuadorians a jury so he could write the decision himself, which was largely cribbed from Chevron's briefs. Kaplan also allowed secret witnesses and refused to consider any of the environmental evidence (such as soil and water samples) that clearly proved the oil company was guilty. For a deep dive into Kaplan's miscarriage of justice, read the 65-page factual summary in this appellate brief. In short, from his Manhattan trial court, Judge Kaplan tried to rule that Ecuador's entire judiciary was illegal. Worse, he tried to singlehandedly overturn a critical ruling from another country's Supreme Court. And he allowed Chevron's made-up facts into his courtroom to justify a defective ruling that has embarrassed the federal judiciary and been lambasted by legal scholars from nine countries around the world. Although Guerra was busted for perjury, Chevron has kept him on its payroll to this day. The $2 million in payments is only what Chevron disclosed it had paid Guerra as of 2013. Today, that number is surely an order of magnitude greater, but Chevron refuses to disclose the real value of the slew of benefits it has bestowed on this tawdry criminal. When the dust clears and the villagers collect on their judgment – most likely in Canada, where they are advancing toward a seizure of company assets after winning a unanimous decision before the country's Supreme Court – that will not be the end of the story. The people in and out of Chevron responsible for this abuse of power need to be held accountable. They include, most notably, Chevron CEO John Watson, Chevron General Counsel R. Hewitt Pate and Randy Mastro, Andrea Newman, and Avi Weitzman from the outside firm of Gibson Dunn. Chevron's RICO case and the bombastic, inaccurate, and pre-ordained factual conclusions of Judge Kaplan's show trial are currently being reviewed by a New York federal appellate court. That court had a relatively easy job to begin with, given the many fatal flaws in Chevron's case. The U.S. Supreme Court's latest decision on the RICO law just made that job even easier. Reposted from Eye on the Amazon. 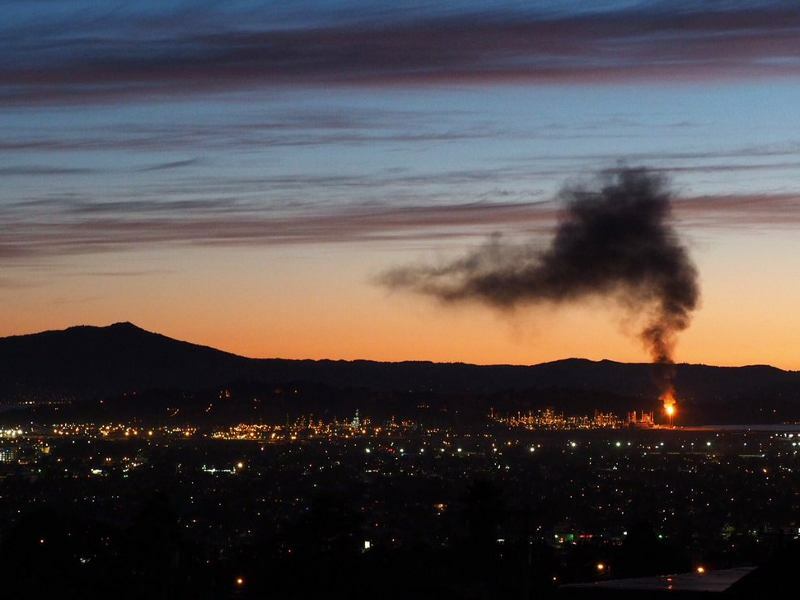 Chevron sending up massive flares in Richmond is not the only sign things are getting hot for the oil giant on the run from a $11 billion verdict. On June 19th, Chevron's Richmond refinery erupted a torrent of flames and black smoke into the air and terrified local residents. The community remembers all too well when 15,000 people were sent to the hospital when that same refinery exploded in 2012. Unfortunately, since then the public hospital in Richmond has closed. They can't afford another explosion as the closest public emergency room services are now thirty to forty minutes away in Oakland. But that's not the only thing "on fire" at Chevron lately. Similar to the company's claims that it needs massive flares to burn off excess gas, Chevron claims there's "nothing to see here" as it tries to sell off US $5 billion in assets in its Burnaby oil refinery in British Columbia. But the company's actions and track record tell a different story. Realizing it was going to lose in its legal battle and be forced to accept responsibility for deliberately dumping 18 billion gallons of toxic waste into the Ecuadorian Amazon, Chevron instead sold off all its assets and fled that country. It's been a corporate criminal on the run ever since, but the law is finally catching up with Chevron – in Canada. In September, the Ecuadorian plaintiffs – bolstered by a unanimous decision in their favor by Canada's Supreme Court – will begin their trial to seize Chevron's Canadian assets to cover its US $11 billion debt to the affected communities in Ecuador. Chevron currently holds approximately US $15 billion of assets in Canada, almost all of which is at risk due to this enforcement action. Chevron refuses to acknowledge its full liability to the SEC and to its shareholders, and this latest move may give a clue as to why. Unable to replicate its customary racist attacks against Ecuador's judiciary and legal system, Chevron has to dream up new methods in Canada. The Ecuadorians have defeated Chevron in every single legal contest which has considered the evidence of their crimes in Ecuador (Chevron's singular victory – a retaliatory RICO SLAPP suit in the US – notoriously forbade any evidence of contamination in its proceedings and is still under appeal). The writing is on the wall in Canada, and Chevron is trying to slip out quietly and escape justice once again. To make matters worse for the oil giant, a recent U.S. Supreme Court decision on the use of RICO may preemptively doom its defense before the Second Circuit Court of Appeals in New York. As respected appellate attorney Deepak Gupta wrote, the Supreme Court decision "further limits private RICO actions by requiring proof of a quantifiable, redressable and domestic injury – something Chevron has steadfastly refuse to identify." The decision also made clear that the RICO statute could not be used to attack a final judgment from a foreign court, as Chevron has tried to do in the Ecuador case. Aaron Page, a U.S. lawyer for the Ecuadorians called it a "nail in the coffin" of Chevron's RICO case. He added, "Now, the Supreme Court has ruled you can't bring a RICO case, even a legitimate one, based on harm that took place abroad. This is another example of why Chevron's RICO case should have been thrown out on day one." Bottom line on these developments: no matter how desperate it gets, Chevron can't hide its actions in Canada or its pollution in Ecuador or Richmond.